There’s an amazing brunch place in Dallas that serves $1 bellinis and mimosas until 2 p.m. They limit you to six (six! ), but the mimosas are basically champagne with a little splash of orange juice, in other words, a perfect mimosa. That, in itself, is reason enough to drive across town and, inevitably, waste the remainder of your day in a post-brunch coma, but they also have amazing food. 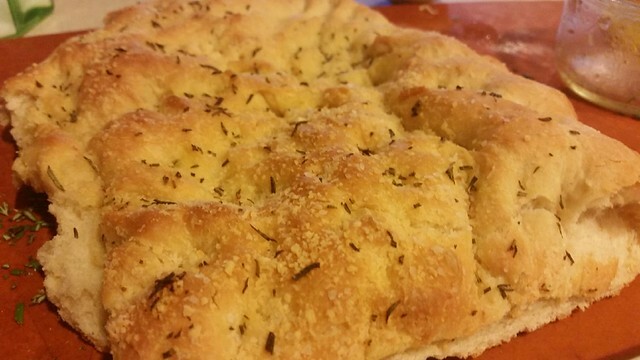 Specifically, their focaccia bread is out of this world. They bring it before your meal on a big pizza pan and ours is always long gone. After several trips, I decided to try and replicate the focaccia – I had big dreams of doing it one afternoon following brunch, but after 3 mimosas, 4 slices of bread, and a massive eggs benedict (to think – I used to hate brunch food! ), all I did was lie on the couch and watch The Little Mermaid with my kids for the millionth time. I’ve eaten many focaccias over the years – some with onions, olives, and other craziness. Typically if there’s a food option that contains additional fancy ingredients such as those, I’m all in, but, in the case of focaccia, it’s truly a less is more situation. This calls for no toppings except rosemary, salt, and a little parmesan cheese. It’s shockingly easy to make, and a really great introductory bread if yeast breads intimidate you. Basically, when making bread, in order to get your dough to the right consistency you either need to add your flour to your water or water to your flour slowly. So much depends on how sifted your flour is, the humidity in the air, the heat in your kitchen, etc. Most breads have you mix the wet ingredients and add flour until you reach the desired consistency, but in this recipe you add water, and I think it’s easier to gauge the consistency that way because it’s easier to add until the dough just sticks together. I grow rosemary in my garden, so I have the ingredients for focaccia on hand all the time and started making it about once a week. You really only need an hour and a half of rise time and half an hour of baking, so it’s possible to make on a weeknight, which is rare for bread. I actually use canned parmesan cheese for topping – typically I’m a total cheese snob and use fresh grated, but in this case, the can is pretty ideal. 1. Stir the flour, yeast, and salt together in the bowl of a stand mixer with a bread hook. Add in the oil and mix until well-combined. Add the water slowly, a half cup at a time, until the dough comes together in a ball. Use the mixer to knead the dough for about 5 minutes, until smooth and elastic. Transfer to a greased bowl, cover with a dishcloth, and allow to rise in a warm spot for about an hour when the dough is doubled in bulk. 2. Punch the dough down and spread into a rimmed baking sheet. Continue to work the dough until it covers the bottom of the pan. Allow to rise for an additional 30 minutes while preheating the oven to 425. Dimple the dough all over using your fingertips and drizzle with olive oil, salt, fresh rosemary, and parmesan cheese. 3. Bake for 20-25 minutes until golden brown.